What about the ridiculous bottleneck at stage one? An alternate path would be great, like going up a slope from where the ghost can be spawned and reach the torch to the right (seen from attackers point of view) of the pyre, perhaps with an entrance into that weirdass room in the mountain as well. But then the burn time would have to be increased again. The incremental capture of the trebs would mean it wouldn’t be quite so tiresome to capture 4 objectives since you wouldn’t lose your progress every time you got wiped. May or may not be more fun. Smashing them with weapons would be good, too. I think it would be more fun this way. Being able to attack them with weapons would cause the attackers to lose the 2 man requirement which currently forces at least a small amount of coordination. I love the idea of an alternate path. I’ve always thought the bottleneck made defending far too easy. So, agreed: increase burn time, forge a new path around the right side from attacker’s POV. The only problem with that is that masons will camp the pyre more, whereas now if they get overconfident you can sneak up the left and get the fire going. The left path is incredibly difficult to pull off. In random PUGs, it is successfully done maybe 1/10 times. It is just too difficult with spawn times and such. The problem with Hillside is that the first stage is far too easy to defend, the second too hard, and the third too hard. I would like to see old treb 3 added back in to make the second stage easier to defend, and it would be nice for there to be one more path on the opening stage. Closer to 90% for taking the left route past the spawn for me in pubs, but then its the only path I ever take, and disposing of the few people that bother to defend it is generally not an issue. Comp play is completely the opposite though ahah. Ahhh, Ol’ treb 3. I remember it well. amassing all your team for a huge charge with people coming up from the stairs and others charging down onto the treb from above. 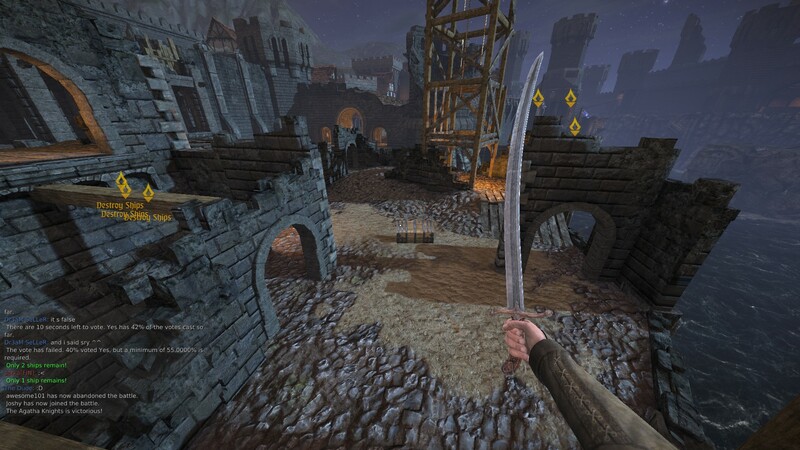 It really was one of the highlights of Chivalry, due to how hotly contested it was. All players had a sense of purpose. Now with most objectives on most maps, people run off and do there own thing and rack up there KDR instead and the battle loses almost all sense of immersion. I really would love to see this as 2 versions of hillside. Keep the first as it is, with perhaps a slight increase to ship health for balistas (right now it is far too easy to win the last obj). And then a new version with an alternate route up to the pyre with a longer burn time and the reintroduction of the old treb 3. So it becomes 4 again, just leaving the capture time as it is currently. I’d also really like to see points being awarded to defenders when in the cap area of an objective, but i’ll leave that to another discussion. I certainly don’t miss the days of “do treb 3 first or we’ve effectively lost the game”. That takes a level of coordination that is a rarity on pubs. Increase destroy times sure, increase fix times for smashed balista’s yeah but FFS don’t revive treb 3. Okay I’m retarded. I don’t remember an old treb 3 and I’ve been playing since Jan 2013. As far as I can remember it has been the same. Was this before I started? Where was old treb 3? ^To the left when you run out of the mason spawn, where the archers usually camp by an ammo box. also need 15 spectral echo’s to come charging out randomly at aghatians coming from spawn at 3’rd objective. I was hard, but doable and very satisfying to get. The various avenues of approach gave it a tactical edge missing from a lot of objectives in the game, but what I liked best about it was it really brought teamwork out of a pub team, because it required it and was fun to coordinate on. Having a pub team ‘gel’ to capture treb 3 was a great chiv moment, and the game’s weaker for having lost it……Please bring it back! Are you talking about your younger self? Back then his trebuchet brought all the boys to the yard. I was hard, but doable and very satisfying to get.